Since his May 8th arrest, James Robinson has been held incognito, moved, and denied visits. This flaunting of basic human and constitutional rights is unprecedented in any civilian case in American history involving a US Citizen. Reality Winner is held without bail and the case against her is classified, but her location is known and she has a lawyer of her choosing. James Robinson is charged with a simple violation of the Computer Fraud and Abuse Acted for a single distributed denial of service attack against the Akron Police Department as part of a protest against police corruption. It is the equivalent of a digital sit in. The treatment he has received so far, prior to his trial, echos the acts of historic totalitarian regimes of the early 20th century. There are two men behind this and they have a long history of targeting non-violent protestors as “terrorists” in North East Ohio and were part of the nationwide crackdown on the Occupy Wall Street Movement in 2011. FBI Special Agent Stephen B. Anthony and then Assistant US Attorney Justin E. Herdman were the lead agent and lead prosecutor on the case of the so-called Cleveland 4. Five Cleveland Occupy Activists were entrapped into a bomb plot by FBI agents. They had no plans, or knowledge, or actual explosives until they were given these things by the FBI and then arrested. One turned states evidence and then his plea deal was rejected and he is servicing time along with the others. When they are released, all will be on federal parole for the rest of their lives. This “bomb plot” was created entirely by the FBI and was part of a systematic crackdown on the Occupy Wall Street Movement. Before the protests even began, the FBI called the group terrorists in communications and alerts nationally. As the protest progressed, a national attack was launched, which was coordinated by an extra-legal non-profit called the Police Executive Research Forum (PERF). PERF moved on to form the backbone of the Obama's Administration’s Task Force on 21st Century Policing, where it pushed useless body cameras as a solution to police brutality in order to usher in a new layer of surveillance and biometric tracking. Assistant US Attorney Herdman is now THE US Attorney for the North District of Ohio. Fame-ups and entrapment have caused his career to rise. 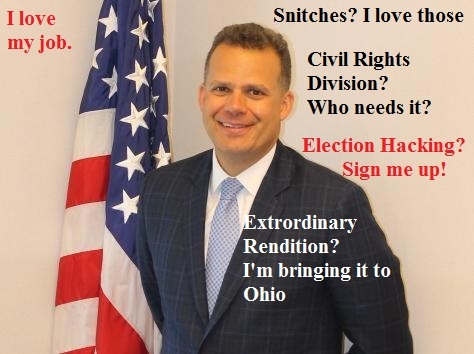 In October of 2017, in his new capacity as the head federal prosecutor, his dismantled the Cleveland area's civil rights division. As shown by his repeated actions, civil rights and human rights are not a priority in for the Department of Justice nationally or Herdman personally. Government service is not the only place that Herdman has used the law as a high caliber weapon against society. Prior to being a US assistant attorney, Herdman defended white collar criminals at the prestigious Jones Day law firm. Jones Day represented voting machine manufacturer Diebold in numerous cases. They also finance a nexus of legal think tanks that attack exit polls, which serve as a check against election hacking. Herdman was joined at Jones Day by Jonathan Lieken. Both of them live in Cleveland. Both were US Attorney's in the Southern District of New York at the same time. They authored at least one article together. Jones Day prosecuted one of it's own attorneys, Steven Heller, for blowing the whistle on Diebold implementing unknown and untested software patches on it's election equipment in California. Although Heller was convicted, Diebold was fined $2.6 million by the State of California. Lieken is now a Senior Vice President of Diebold, which is headquartered in Cleveland. Herdman has built a literal career out of the use of snitches (like Mary Lou Langley AKA Mary Lou Carpenter AKA Vampgirl69 in Robinson's case), the dismantling of civil rights, entrapment and election fraud. When not working in that capacity, he defends white collar criminals, prosecutes whistleblowers and frames activists. The Mockingbird will continue to monitor his latest escapade.